On November 5 in the keynote address before the Center for Strategic and International Studies’ (CSIS) Global Security Forum US Defense Secretary Chuck Hagel said the Pentagon needs to make significant changes«across every aspect» of the defense enterprise. He identified six focus areas that will guide a major Department of Defense (DoD) reform effort… The troop organization, military training and equipment purchases, will be re-evaluated in the Quadrennial Defense Review, which is due to Congress early next year. «The goal is to ensure they better reflect our goals in the shifting strategic environment, the evolving capacity of our allies and partners, real-world threats and the new military capabilities that reside in our force and in the hands of our potential adversaries», Hagel said during a speech at the CSIS think tank. «We must make sure that contingency scenarios drive force structure decisions, and not the other way around». DoD must prepare for a future in which non-deployed troops are not trained to the levels they are now. «We may have to accept the reality that not every unit will be at maximum readiness, and some kind of a tiered readiness system is perhaps inevitable», he said. – Institutional Reform. This summer, Hagel announced a 20-percent reduction in headquarters budgets across the department, beginning with the Office of the Secretary of Defense. – Re-evaluate military’s force planning construct. «The goal», he added, «is to ensure they better reflect our goals and the shifting strategic environment, the evolving capacity of our allies and partners, real-world threats, and the new military capabilities that reside in our force and in the hands of our potential adversaries». – Preparing for a prolonged military readiness challenge. This is the Department’s highest responsibility to its forces, the Secretary said, and yet already, «we have seen the readiness of nondeploying units suffer as training has been curtailed, flying hours reduced, ships not steaming, and exercises canceled». – Protecting Investment in emerging military capabilities – especially space, cyber, special operations forces, and intelligence, surveillance and reconnaissance. «As our potential adversaries invest in more sophisticated capabilities and seek to frustrate our military’s traditional advantages, including our freedom of action and access… around the world», he said, «it will be important to maintain our decisive technological edge». – Balanced mix between capacity and capability. «In some cases we will make a shift, for example, by prioritizing a smaller, modern and capable military over a larger force with older equipment. We will also favor a globally active and engaged force over a garrison force», Mr. Hagel explained. – Personnel and compensation policy. «Without serious attempts to achieve significant savings in this area, which consumes roughly now half the DOD budget and increases every year, we risk becoming an unbalanced force, one that is well-compensated but poorly trained and equipped, with limited readiness and capability», he said. Going forward, the department must make hard choices in this area to ensure that the defense enterprise is sustainable for the 21st century, the Secretary noted. The planning reform is a response to budget constrains as it is emphasized in all comments on military issues. The US arms spending is reported to be on the slide due to the sequester resulting from financial woes the nation gaces. Speaking before the Senate Armed Forces Committee in February Chairman of the Joint Chiefs of Staff General Martin E. Dempsey said the sequestration will «put the nation at greater risk of coercion». At that the key military programs are on and running giving rise to concern among other world actors. On May 1, 2013 X-51A Wave Rider, an experimental unmanned aircraft developed for the US Air Force, flew at more than five times the speed of sound in a test off California. The test marked the fourth and final flight of the UAV. This is a breakthrough in scramjet technology that allegedly can be used to deliver strikes around the globe within minutes. This was the fourth and last in a series of tests. The Wave Rider is designed to reach speeds of Mach 6 or above, six times the speed of sound and fast enough to cross the Atlantic Ocean and strike a target in Europe in less than an hour. Many details of the program are classified…What is known is that the Air Force will continue hypersonic research and the successes of the X-51A will make a contribution into the High Speed Strike Weapon program currently in its formation phase. Lockheed Martin has unveiled plans for a hypersonic spy plane SR-72 that could fly at hypersonic speed. It was designed using off-the-shelf materials to keep it affordable in the current tough budget environment. Aviation Week and Space Technology’s Guy Norris published an exclusive article devoted to SR-72. The new airplane will be roughly the same size as the record-setting Blackbird, but will be able to fly twice as fast. It will be capable of Mach 6 cruise speeds, making it the first hypersonic aircraft to enter service should it be produced. Guided by the U.S. Air Force’s long-term hypersonic road map, the SR-72 is designed to fill what are perceived by defense planners as growing gaps in coverage of fast-reaction intelligence by the plethora of satellites, subsonic manned and unmanned platforms meant to replace the SR-71. A vehicle penetrating at high altitude and Mach 6, a speed viewed by Lockheed Martin as the «sweet spot» for practical air-breathing hypersonics, is expected to survive where even stealthy, advanced subsonic or supersonic aircraft and unmanned vehicles might not. The aircraft is also expected to have optional strike capabilities. The timing also dovetails with the Air Force hypersonic road map, which calls for efforts to support development of a hypersonic strike weapon by 2020 and a penetrating, Intelligence, Surveillance and Reconnaissance (ISR) aircraft by 2030. The 2018 time line is determined by the potential schedule for the high-speed strike weapon (HSSW), a U.S. hypersonic missile program taking shape under the Air Force and DARPA. The Wave Rider mentioned above matches perfectly with SR-72 greatly enhancing conventional first strike capability (Prompt Global Strike – PGS) evidently going much further then deterring terrorist groups. The match is a formidable weapon against command and control infrastructure, as well as ICBM sites. The higher speed of the SR-72 would also give it the ability to detect and strike more agile targets. Brad Leland, the Lockheed engineer who has headed the seven-year research effort, said the new aircraft offered game-changing capabilities to the military – and a twin-engine demonstrator jet that could reach any target in an hour could be developed for under $1 billion in five to six years. The SR-72’s purpose is to provide the United States with not only a hypersonic recon platform, but also a strike aircraft as well. According to Brad Leland,«Hypersonic aircraft, coupled with hypersonic missiles, could penetrate denied airspace and strike at nearly any location across a continent in less than an hour». No new technologies needed to be invented for the SR-72 so a demonstration aircraft could fly by 2018, and the plane could be operational by 2030. Details of the new hypersonic spy plane project emerged days after Lockheed, the Pentagon’s biggest supplier, teamed up with No. 2 supplier Boeing Co (BA.N) to develop a bid for the Pentagon’s new long-range bomber. In December 11, 2012 the Orbital Test Vehicle Boeing X-37B went through its third test flight. The X-37B, an unmanned robotic reusable vertical take-off, horizontal landing spacecraft, can re-enter Earth’s atmosphere and land autonomously. The robot can even adjust its course in space instead of following the same predictable orbit once it’s aloft. The spacecraft’s orbital endurance is enabled by its solar array, which generates power after deploying from its payload bay making it remain in orbit up to 270 days. The X-37B is no doubt a spy plane as well as a testing model for a future «space bomber» that will be able to destroy targets from the orbit. It cannot be excluded the aircraft itself might be a delivery system for a nuclear bomb, a satellite-tracker or a satellite-killer. On November 2 the Navy has christened the service’s eleventh Virginia-class nuclear attack submarine USS North Dakota (SSN 784) in Groton, Conn. Virginia-class subs have improved stealth and sophisticated surveillance capabilities. Their special warfare enhancements enable them to meet multiple mission requirements. The US Navy’s total requirement is for 30 of the class. The $2.6billion North Dakota (SSN-784) is the first of a planned eight Block III modification Virginia submarines. There are two notable changes from Block II to Block III. The Block IIIs include two Multiple All Up Round Canisters (MAC) fore of the boat’s sail. The MAC tubes can hold up to six Tomahawk Land Attack Missiles (TLAM). The Block IIIs also feature a new sonar in the bow. The Large Aperture Bow (LAB) array requires fewer parts and less maintenance than previous Virginia sonars. Additional changes include improved construction efficiencies from the previous two blocks. 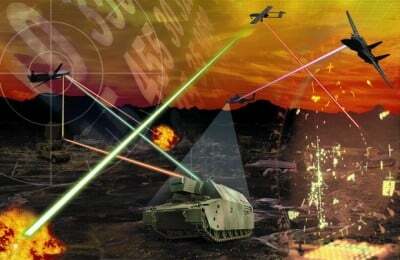 In April 2013 the US Navy announced that it was deploying a laser weapon prototype in the Persian Gulf. For the first time the ships are going to be equipped with a laser attack weapon able to disable patrol boats and blind or destroy surveillance drones as the tests have shown. The Navy calls its new weapon LAWS (which stands for the Laser Weapon System). The prototype shipboard laser is to be deployed on board of the USS Ponce, a converted amphibious transport and docking ship in the Persian Gulf, which serves as a floating base for military operations and humanitarian assistance in the waters of the Middle East and southwestern Asia. The laser will be operational next year. Many of the details about how the laser works remain secret, such as how far its beam can travel, how powerful it is or how much power is used to generate it. What is known is that the laser is designed to be a «plug and play» system that integrates into a ship’s existing targeting technologies and power grids. Those factors make it a surprisingly cheap weapon. The U.S. Navy also has other systems under development that are intended to shoot down enemy drones homing in on surface vessels. Similarly, the U.S. Army announced in 2011 that it was doing research on Laser-Induced Plasma Channel (LIPC), which can fire a laser-guided, 50 billion watt «lightning bolt» at a target. On October 29 Lockheed Martin Corp F-35 fighter jet tested the Guided Bomb Unit-12 (GBU-12) Paveway II bomb launching it from its internal weapons bay while flying at around 25,000 feet, successfully smashing into a tank parked on the ground, the Pentagon’s F-35 program office said in a statement. It took 35 seconds to hit the target. “This guided weapons delivery test of a GBU-12 marks the first time the F-35 truly became a weapon system,” said Marine Corps Major Richard Rusnok, the pilot who flew the plane during the weapons test. “It represents another step forward in development of this vital program.” This marked the first time the jet had fired a guided weapon at a ground target. The Marine Corps plans to start operating the planes in mid-2015.The GBU-12 weapons test was followed later on October 30 by a live fire test at Edwards Air Force Base of an AIM-120 Advanced Medium Range Air to Air Missile, or AMRAAM. A test of the F-35’s ability to drop a 1,000-pound GBU-32 is planned to take place this November. Last month the Navy variant, or F-35C, released its first weapon during testing at Naval Air Station Patuxtent River in southern Maryland, and the Air Force version, or A-model, did the first ground release pit testing of a GBU-39, a 250-pound small diameter bomb. Lockheed is developing three models of the new radar-evading warplane for the U.S. military and eight countries that helped fund its development: Britain, Canada, Turkey, Italy, Norway, Australia, Denmark, the Netherlands. Israel and Japan. Military action against Syria may have been put on hold, at least for now. But US military commanders often see conflicts as opportunities to use recently developed technology… Here are the latest weapons or systems that may be used and why – from microwave to cyber weapons. The Air Force has confirmed it has two agent defeat systems in its inventory. The CBU-107 Passive Attack Weapon (PAW) is essentially a weapon casing packed with thousands of penetrator rods with no explosives. Designed for targets where heat might be dangerous, the idea is that a 450-kg (990-pound) bomb scatters thousands of rods from midair over an area of 60 metres, which can penetrate containers filled with chemical weapons, and allow them to drain into the ground to minimize dispersal. The BLU-119/B Crash Pad is a more explosive, rapid option. The Crash Pad ruptures chemical weapons stores with blast or shrapnel and contains white phosphorous to incinerate chemical agents. The US’s most sophisticated fighter, the F-22 Raptor, has yet to see combat. While Air Force officials have argued the highly maneuverable aircraft with stealth technology would be useful in dealing with Syria’s sophisticated air defence systems and surface-to-air missiles. Spy satellites have long been used to track weapons of mass destruction. In September the National Reconnaissance Office announced the launch of its latest spy satellite, providing no details. The documents leaked by Edward Snowden, the former National Security Agency contractor, and published by the Washington Post, reveal a host of top-secret satellites, such as the intriguingly named Quasar and Intruder. High Power Microwave Weapons can knock out all the computers in a Syrian military command and control infrastructure without causing any physical damage. Last year, Boeing released a video of its High Power Microwave Advanced Missile Project – a missile that essentially fries circuits by causing a surge in power. In the short film, Champ was seen taking out a bank of computers. The Air Force has conducted classified work in high power microwaves for years, and some suspect it already has such weapons available. – The ballistic missile defense systems that the U.S. and its allies had deployed, or were planning to deploy, in the Asia-Pacific region could intercept residue Chinese nuclear weapons launched for retaliation after China had been attacked, thus potentially negating the deterrence effect of the Chinese nuclear arsenal. – The U.S. was developing a series of conventional strategic strike capabilities. When deployed, they could be used to hit China’s nuclear arsenal. Hu Yumin, a senior research fellow at the China Arms Control and Disarmament Association, wrote in January that the U.S. aimed to combine PGS with its space and anti-missile technologies to «form an integrated defense system, which could render other countries’ strategic weapons, including nuclear arms, almost useless». Hu was clearly referring to China. He added that this could put such countries in a dilemma: Either they would lose the ability to launch a strategic nuclear counter-attack or they would have to use nuclear weapons first to avoid devastation. True, Russia and China are increasing their military spending. Russian President Vladimir Putin openly avowed an intention to radically expand and upgrade the Russian military. There is a string of measures to be taken. Russia has embarked on a path of military enhancement. Programs for re-equipping and fundamentally reforming the armed forces are being adopted and implemented. Some ask if this policy is consistent with emerging international realities. There is much lamenting and ballyhoo raised over US military sequester and subsequent cuts across the board cuts. At that, the US fields new game changing weapons. Defense still consumes almost 20 percent of the U.S. budget, more than anything else. The country is the principal determinant of the current world trend, and its military expenditure now accounts for just under half of the world total at over 40 %. Other states express justified concern and have reasons for adopting military policy to match this reality.